You are here: Home » MEDIA » Books » Aria: Left Luggage (book 1 of 3) by Geoff Nelder (book review). 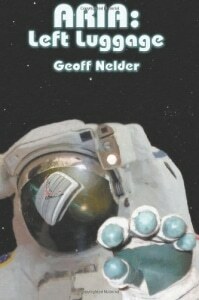 Aria: Left Luggage (book 1 of 3) by Geoff Nelder (book review). Everyone knows about the curate’s egg and that it was good in parts. Books can be like that, too. The problem often is that not everyone can agree which are the good parts. Geoff Nelder’s novel ‘Aria: Left Luggage’ is the first part of a trilogy and a bit like a curate’s egg. Not that any part of it is bad, Nelder is a competent writer, it’s just that some aspects of it are better than others. The concept behind the book has originality. A shuttle approaching the International Space Station discovers an object caught on the outside of the Station. It looks like a small suitcase and since no Earth manufactured object that resembles it is anywhere in orbit, the conclusion is that it is alien. What it is and how it got there remains a mystery. The shuttle crew send it back to Earth for examination. So far, so good. Naturally, everyone is very wary of this object and the authorities go through the correct procedures, except for one thing. The technician that handles the case has a leak in his biohazard suit. This is what causes all subsequent events to kick off. Perhaps we can blame everything on one sloppy technician who should have checked his suit before he went into the situation. In some ways, this is a plot convenience because something from the case has got in through the leak and now he proceeds to spread a highly infectious contagion to everyone he meets. A careless colleague later opens the case properly but since he has already been affected, he is unaware of the possible consequences. This virus, dubbed Alien Retrograde Infectious Amnesia or ARIA, causes an erasure of memory. Not all at once, but gradually starting with the most recent and working backwards as time passes. In other novels, the situation of waking up with memory loss has been taken as a theme. In both Gene Wolfe’s ‘Soldier In The Mist’ and S.J. Watson’s ‘Before I Go To Sleep’, the protagonist wakes up with no memory and has to rely on others and notes to know who they are and who everyone else is. In both these books it is a complete memory wipe and any one person is affected. Nelder puts a twist on this idea with a progressive loss of memory by everyone infected and because of the speed and extent of modern transport, the condition quickly spreads around the world. Nelder has done well to try and imagine the kind of chaos that would ensue with this scenario. Although many of us would envisage it differently, here it leads to a rapid breakdown of civilisation as workers forget to go to work or even where they work and what they should do when they get there. As a result, services such as power, transport and food supply quickly fail. Over the years, there have been many novels where civilisation has broken down on either a national or a world-wide scale. John Wyndham’s ‘The Day Of The Triffids’ and John Christopher’s ‘Death Of Grass’ are ones that come readily to mind. In every case, there are pockets of either survivors or the unaffected. ‘Aria’, having produced an original take on the disaster novel, then begins to travel a well-worn path. Ryder Nape is a journalist with a scientific girl-friend. He was in America when the case was found but had already been sent back to Britain before it was opened. Being in touch by email to the Space Centre, he realises what is going on. He and a small group of uninfected people hole up in a valley in Snowdonia, determined to survive, whatever the cost. Once the infection has taken hold and Ryder’s group are consolidating their position, the plot runs along traditional lines. However, this is the first part of a trilogy so there needs to be something to lift it out of the ordinary and nudge the reader into wanting volume two. Fortunately, Nelder has not run out of ideas. Perhaps the biggest stumbling block to accepting this scenario are the dates at the start of each chapter. To pin it down to 2015 is a mistake. It is too close to now, which means that in two years time, the book will become dated, unless Nelder has a means to overcome this. If so, it will have to be very original. As far as style, this is undemanding but has a large cast of characters, some of which are on stage for a short time which doesn’t allow for an in depth development. To a certain extent the quick shuffling between scenes would lend itself to a filmic rendition of this novel. The big question is whether I would want to read the second volume. Although I would probably not diligently seek it out, there is enough that is intriguing for me to want to read it if a copy came my way. « Iron Man 3… Pepper Potts gets a-head?